Balanced. 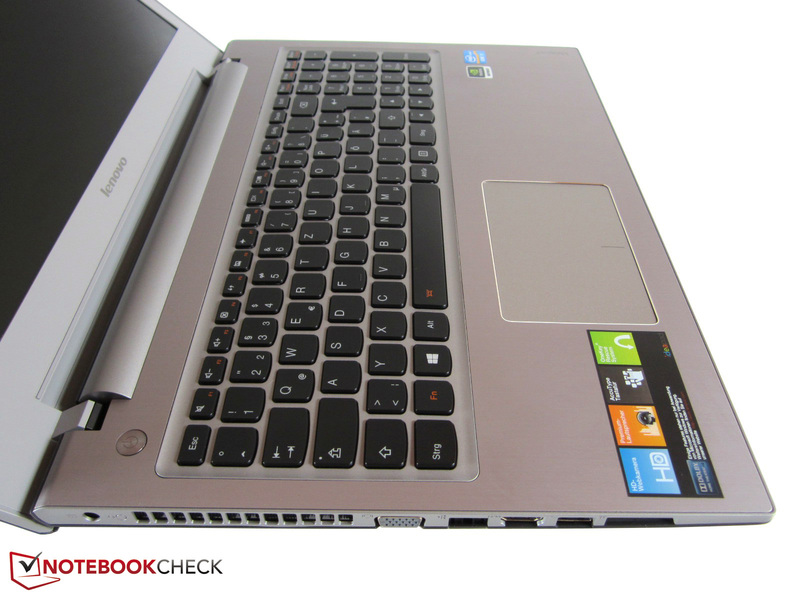 The IdeaPad Z500-MBYG2GE is aimed at performance hungry multimedia users in particular. With an energy-saving Quad-Core and a GeForce GT 645M, the 15-inch device offers sufficient power for most (3D) applications. We have reviewed the all-rounder and will report our findings here. 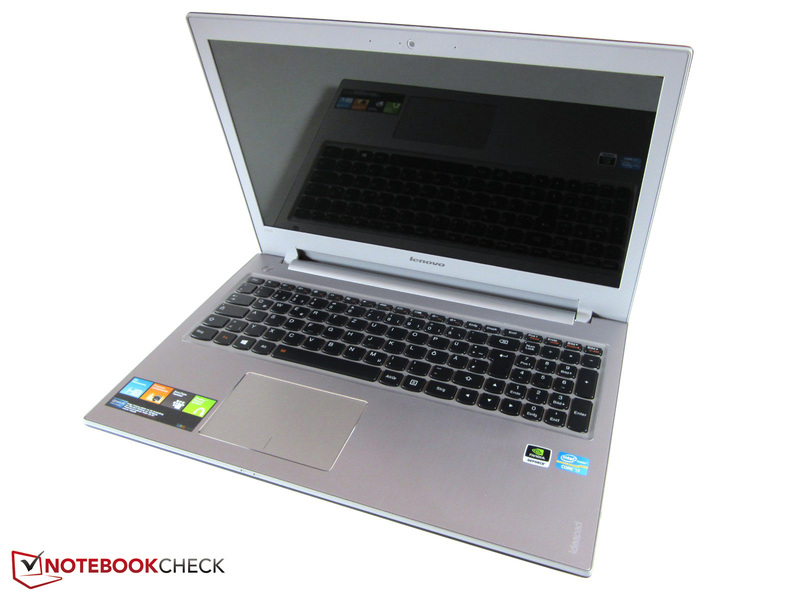 On the price comparison site Geizhals, one can discover 100 variations of the IdeaPad Z500. DVD burner or Blu-ray Player, glare or matte display, with or without Touchscreen: The selection almost seems infinite. We have quickly decided to go for the version MBYG2GE (many thanks to the team at notebooksbilliger.de), which costs about 800 Euros (~$1044). Apart from the quad-core processor Core i7-3632QM, the test unit contains eight GB DDR3-RAM (1,600 MHz) and a 1,000 GB HDD running at 5400 rpm. In addition, there is a DVD drive and a glossy HD display (1366x768). The GeForce GT 645M is a DirectX-11 enabled mid-range GPU from Nvidia. 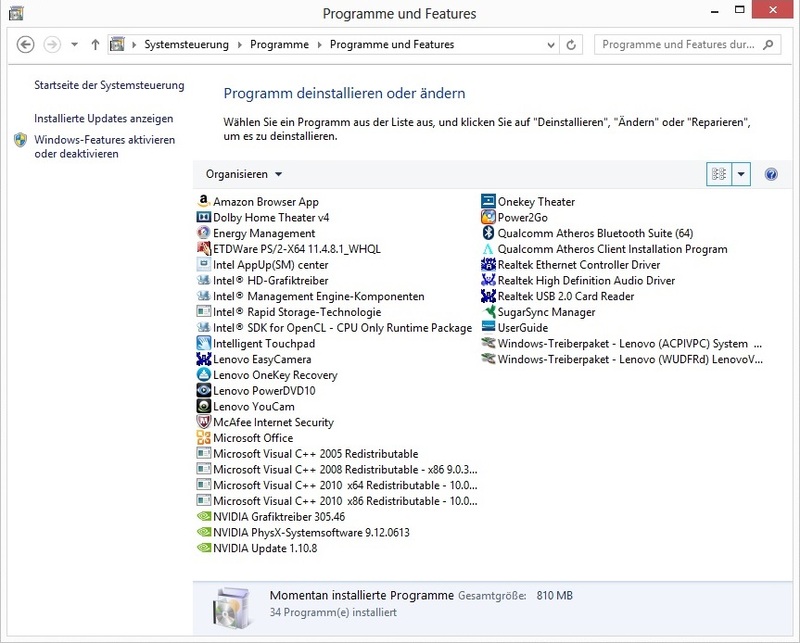 The 64-bit-Edition of Windows 8 usually indicates a modern system. Can the 15-inch device measure up to the tough multimedia competition? 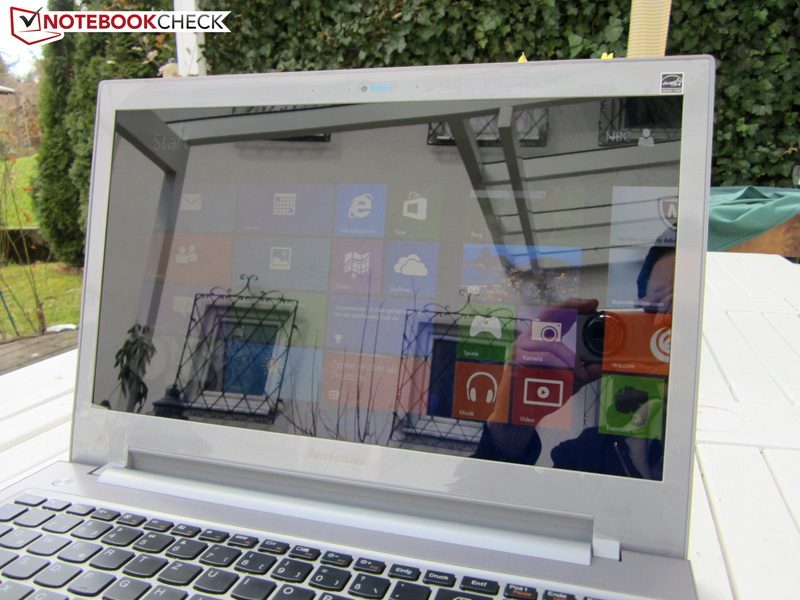 Visually, the IdeaPad Z500 leaves a very good impression. 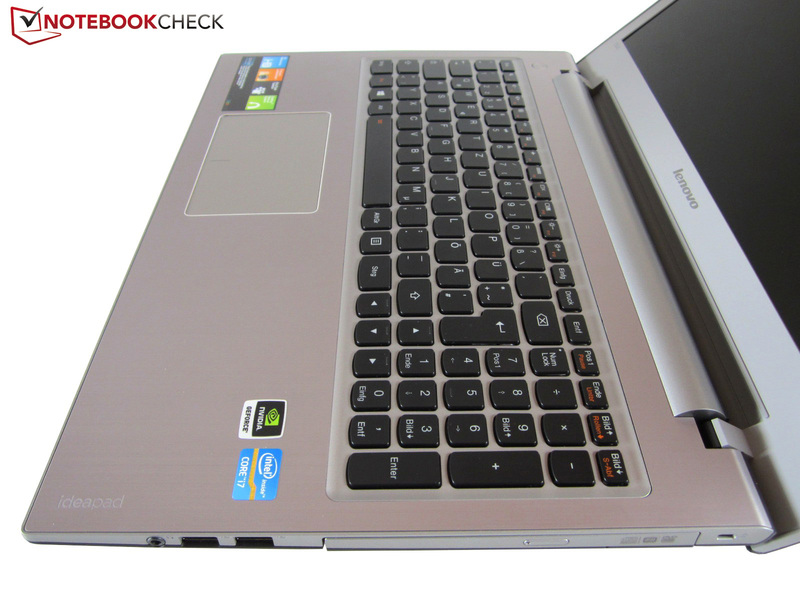 Color and material choice are not dissimilar to the current Asus N56VB. While the silver-gray keyboard area consists of brushed metal, the lid and bottom plate are manufactured using plastic (black matte). The fact that the all-rounder seems of high quality, can be attributed to the good workmanship, which is better than the average - apart from smaller flaws (the optical drive of our review unit wasn't perfectly aligned with the side plate). Because of the slim build (just about three centimeters high) and the somewhat more sophisticated visuals, the IdeaPad Z500 appeals to us more than the Asus N56VZ. 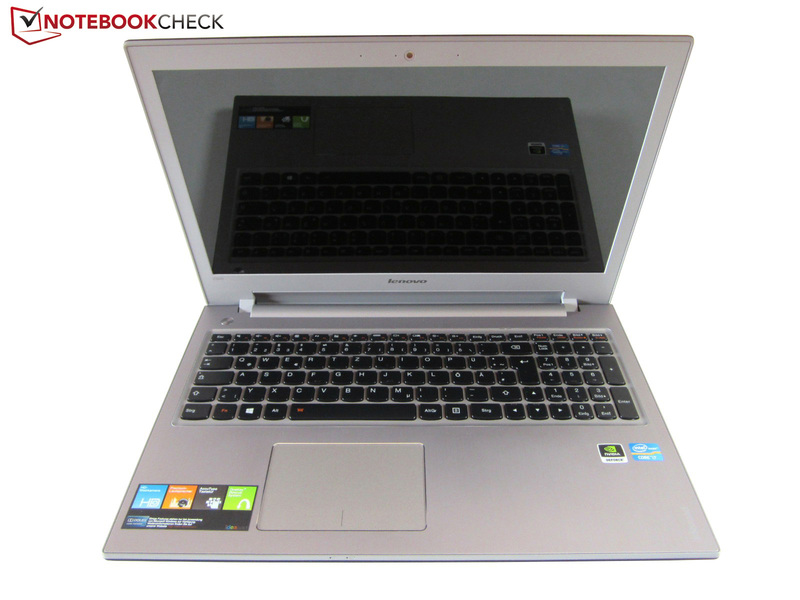 The notebook conveys a noble character both in a home and business environment. However, it is just not enough for an outstanding performance. On the one hand, the display frame is too bright. Due to the different color, it slightly conflicts with the cover of the notebook. On the other hand - although a success overall - there is a distinct bulge above the keyboard. However, the biggest point of criticism is the lack of stability. 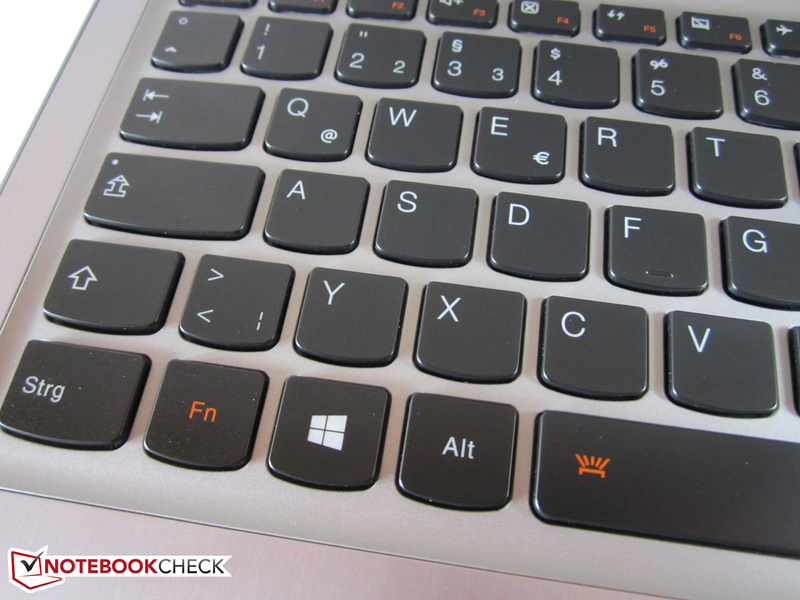 While the bottom plate fares fairly well, the keyboard gives in to pressure during normal usage. This is also applicable to the area around the optical drive. The hinges are not optimal either. Even though the lid requires both hands to be opened, it clearly starts to swing when there are vibrations from the ground. A maximum opening angle of about 135° corresponds to notebook standards. Positive: Thanks to the moderate weight (~2.36 kilograms/~5.2 pounds), the 15-inch unit can be transported easily. In terms of connectivity, the device deserves the label "lean". It is one thing, that there are less and less built-in eSATA, FireWire ports and ExpressCard slots nowadays, but that the integrated card reader can only recognize two formats (SD, MMC), the RJ-45-Port does not support Gigabit LAN and Lenovo only offers three USB ports and a combined audio jack (headphone + microphone), goes too far in our opinion. For about 800 Euros (~$1044), one should be able to expect a bit more. Two video outputs (VGA + HDMI), a theft safety device (Kensington Lock) and an HD Webcam do not really make up for it. We are also not very happy with the arrangement of the interfaces: One has to get used to reduced space if there are many cables on the left side (mouse, etc.). Contrary to most other manufacturers, Lenovo does not use a communication model by Intel, but by Qualcomm. The PCIe adapter carries the name Atheros AR9485WB-EG. Besides WLAN 802.11 b/g/n, Bluetooth 4.0 is also on board. A maximum transfer rate of 150 Mbit/s (2.4 GHz) is not amazing, unfortunately. Some competing products can transfer data at up to 300 or 450 Mbit/s (2.4 + 5.0 GHz). We would define the range of the radio module as average. The upgrade options leave much to be desired: Because there are actually none. A service cover is missing as well as a removable battery. Theoretically, one could remove the whole bottom plate (the lower surface is secured with several screws), but we did not manage to succeed in doing so. Out of consideration for the review unit, we didn't want to handle it too roughly. 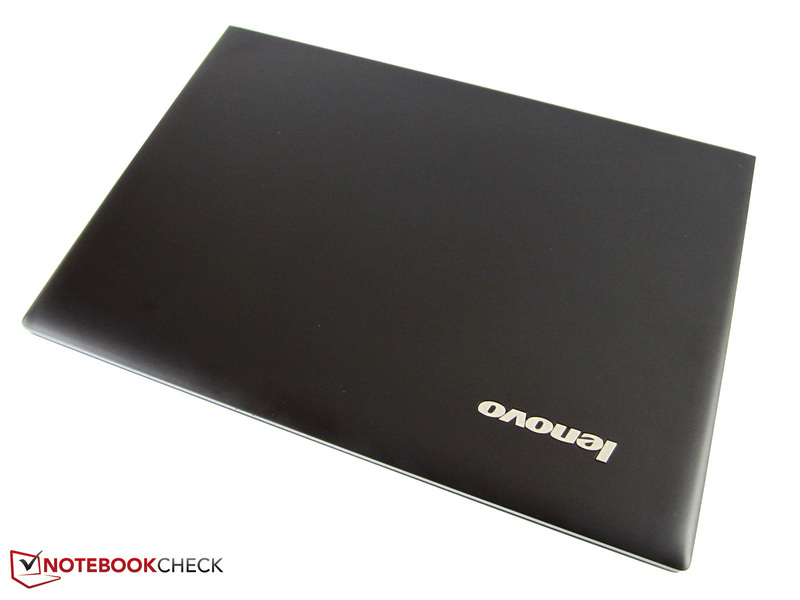 Lenovo provides the IdeaPad Z500 with some nice bundled software. 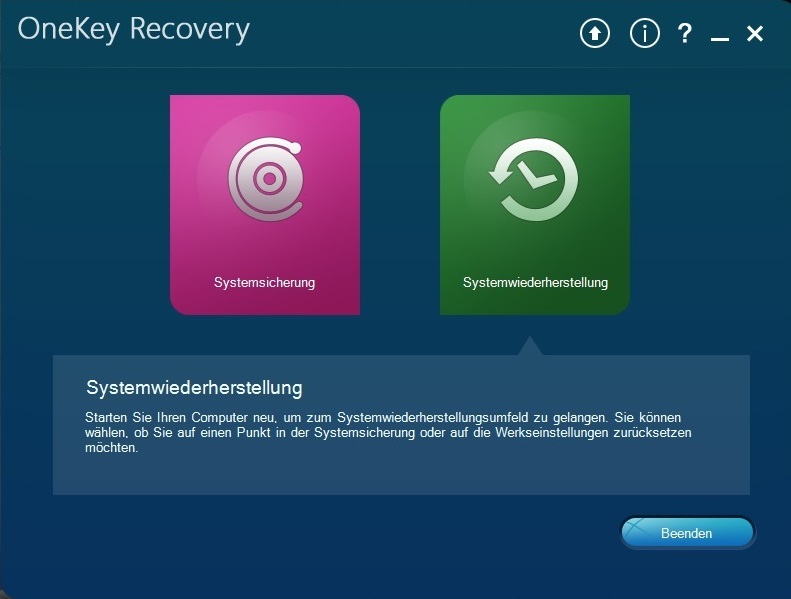 Besides the tool "Energy Management” (a special battery mode and an option for fan cleaning) we also liked the “OneKey Recovery”, which allows for easy reset of Windows 8. 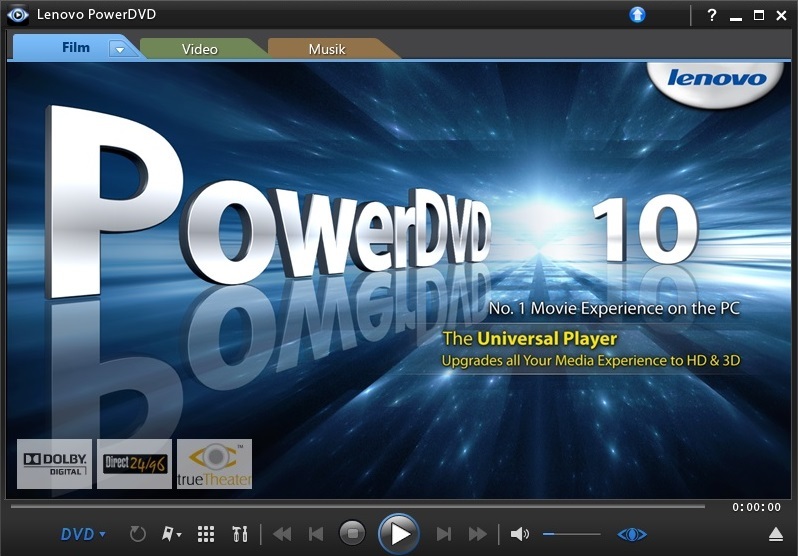 Movie lovers would enjoy the provision of PowerDVD 10. 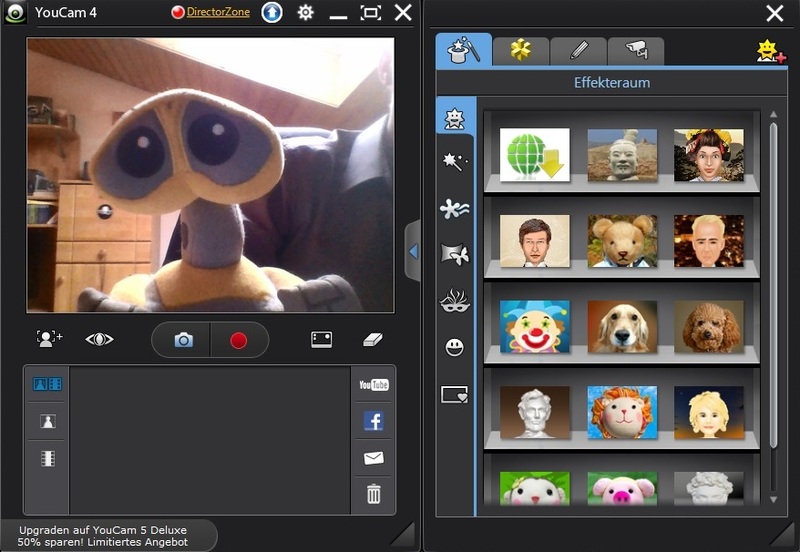 The package is completed by an extensive webcam software (see screenshot), and time-limited office and anti-virus applications. Lenovo did not include any unnecessary bloatware. Following the current trend, the manufacturer does not provide a Recovery DVD either. The buyer must make do with a setup leaflet, warranty card and a safety instruction. We were surprised about the power adapter: The external 90 W power supply is designed like a traditional remote control, i.e. long and narrow (167 x 41 x of 30 millimeters/~6.6 x 1.6 x 1.2 inches). The warranty is valid for 24 months. Accident cover is provided as an option. 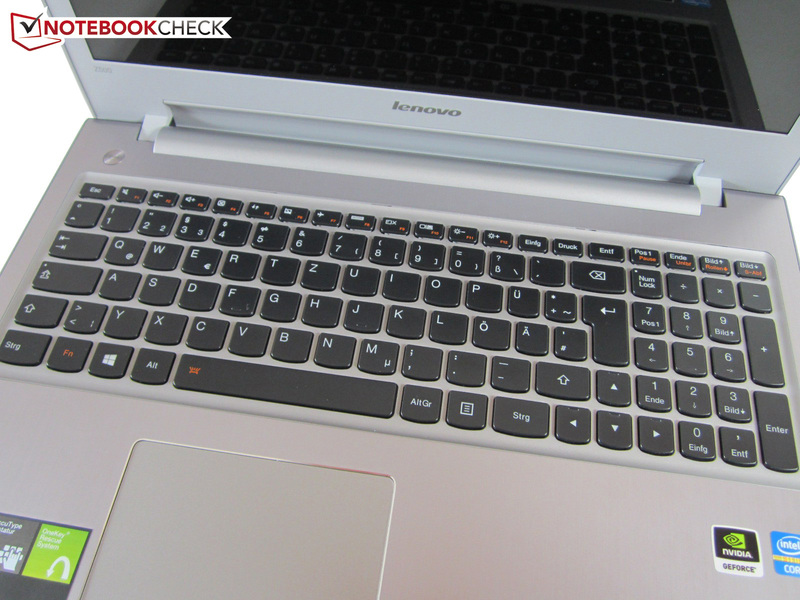 Lenovo uses the term “AccuType” for the keyboard. 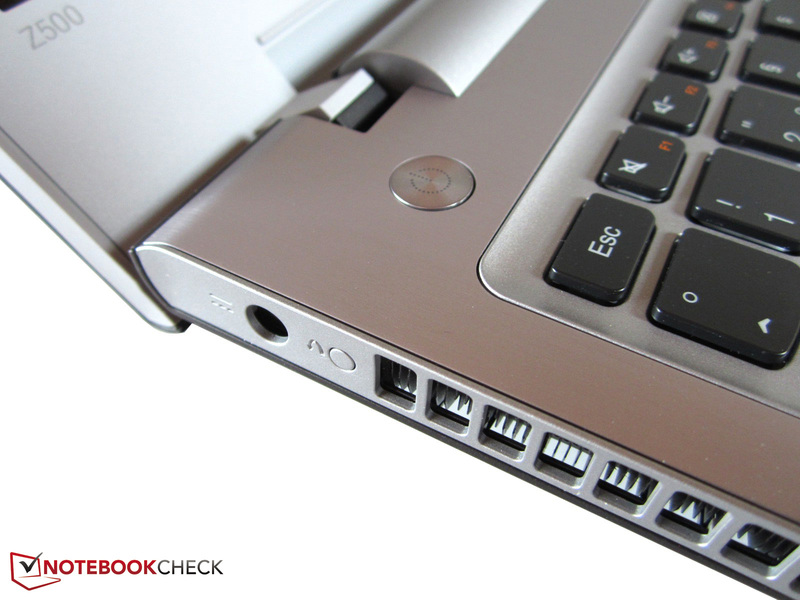 The rounded keys are free standing and have gaps of several millimeters in between. 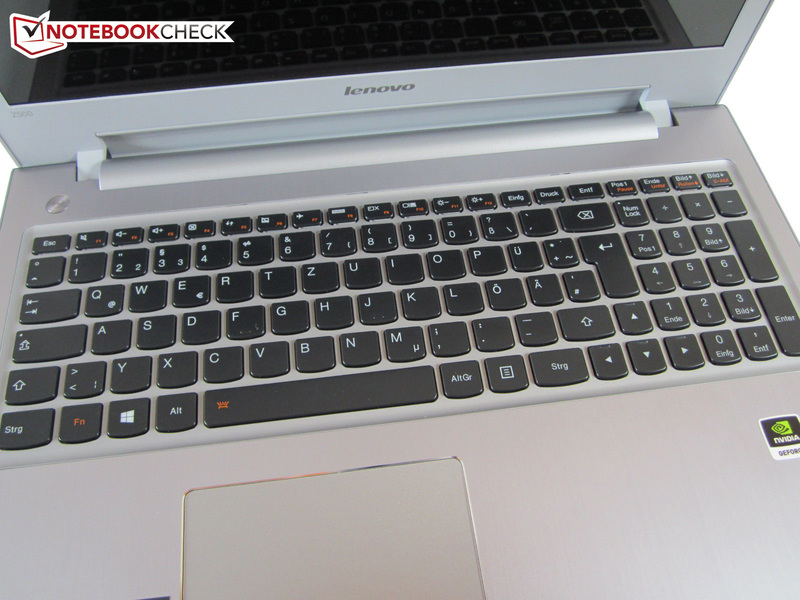 Owing to the curved key form, working on the notebook becomes a pleasure. At least in theory, because in practice the keyboard feels a bit spongy. This problem is not only due to the relatively weak pressure point, but also mainly due to the mentioned stability issues. While the average consumer can live with this, users that are more sophisticated should try to avoid this device. 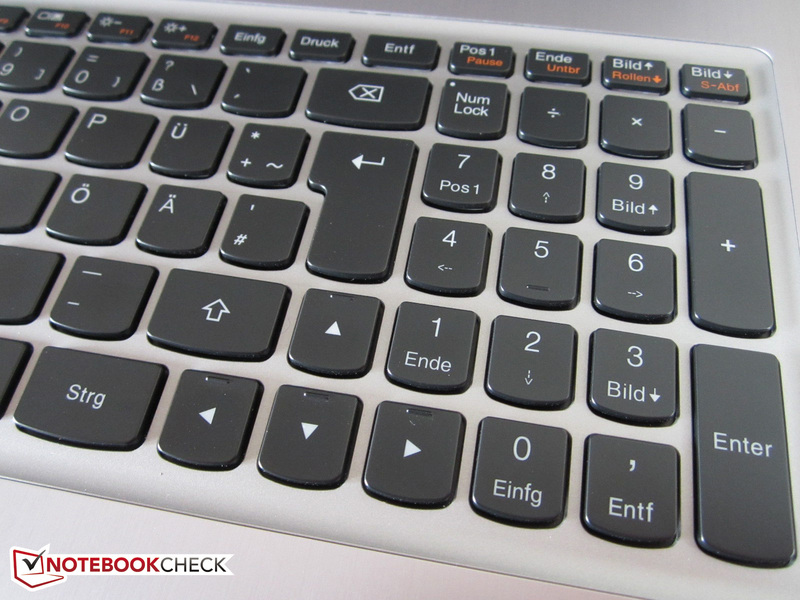 Despite the mentioned flaws, the keyboard receives the rating "Good". On the positive side, we have the well thought-out layout, the dedicated numeric keypad, which keys are smaller than that of the main pad (13.5 vs. 15 millimeters width/~0.53 vs. 0.59 inches). Unusual: The special keys typical for notebooks (display brightness, volume etc.) can be activated without simultaneous pressing of the Fn key. This behavior cannot be changed in the BIOS. By pressing the Fn + space keys, the keyboard backlight is activated, which illuminates in a white color and evenly (only one stage). 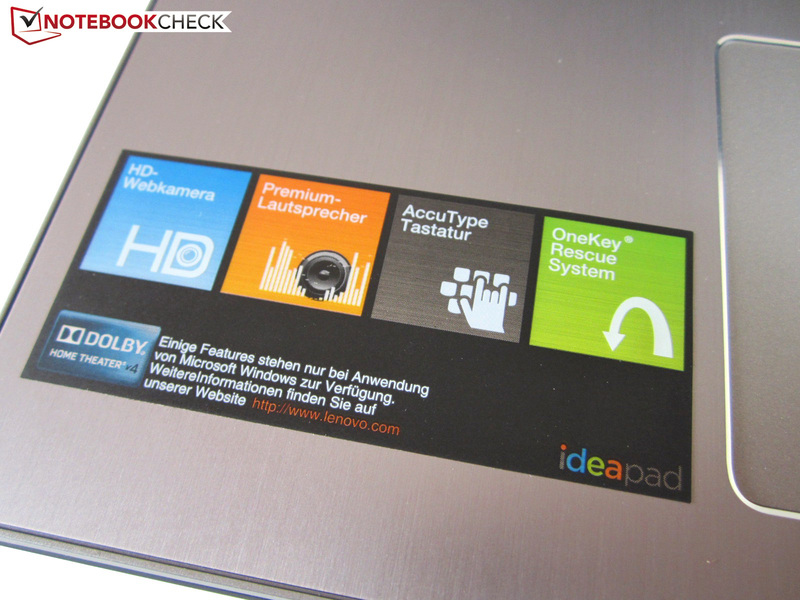 The touchpad mechanics are definitely a matter of taste. Different to traditional versions, there are no dedicated mouse keys. 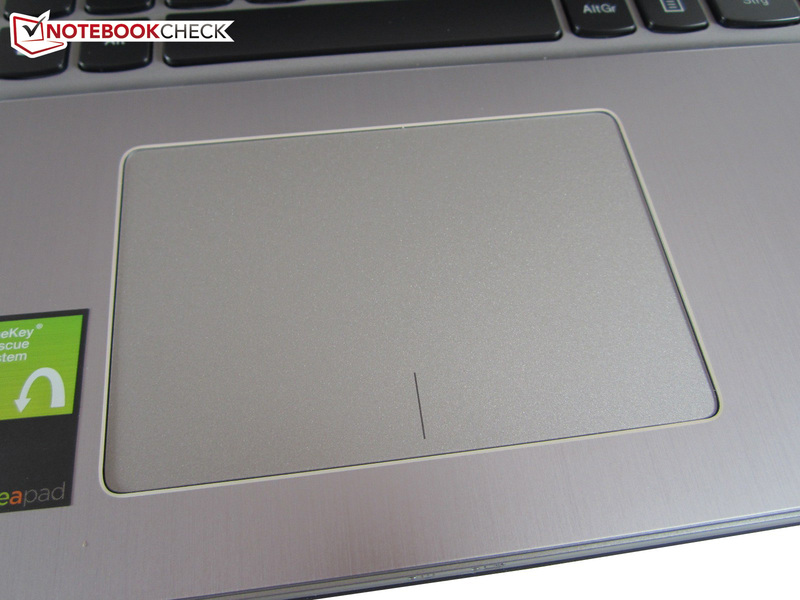 Left and right clicks are achieved by pressing above the lower frame of the touchpad. Plus: The fingers do not have to experience a drastic transition. 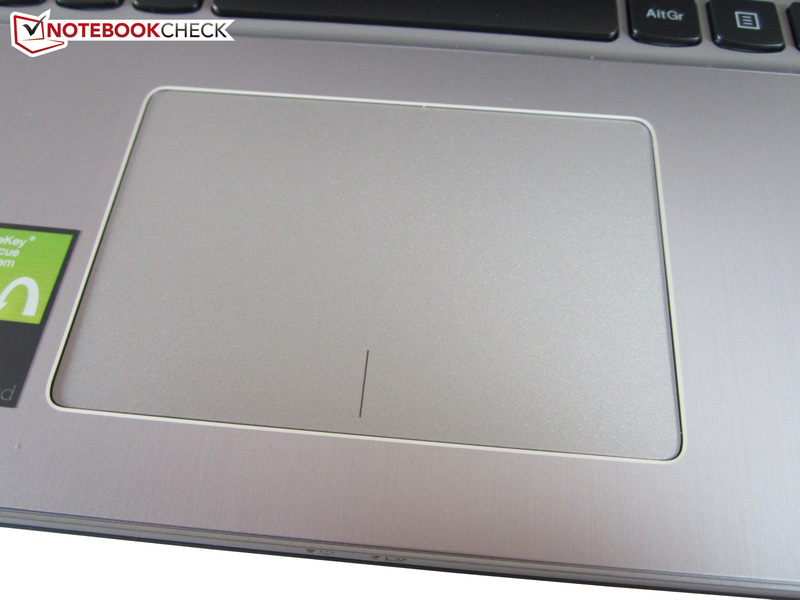 Disadvantage: The entire touchpad appears weak and can be bent quite noticeably. Precision is not the greatest either: Mouse movements often appear inaccurately. 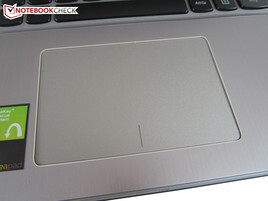 As expected, the touchpad recognizes gestures such as zooming, scrolling and rotating. We found the smooth surface and the generous dimensions (10.5 x 7 centimeters/~4.1 x 2.8 inches) particularly nice. Since the touchpad starts at the very left end, one should definitely disable it during gaming - unless an external mouse is used. We were not able to like the display. The 15.6-inch HD display with a glossy surface (CMN N156BGE-LB1) could not even come near high-quality TN-colleagues like the LG Philips LP156WF1 (Asus N56VB) in any aspects. 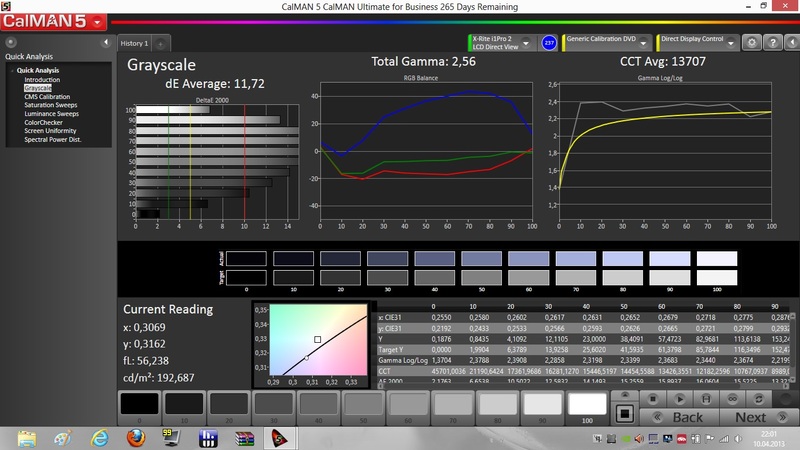 The biggest weak point is probably the low brightness: Approximately 180 cd/m ² is even poor for indoor usage. Good panels can easily reach 200-300 cd/m ². Even though the black level (~0.3 cd/m ²) and the contrast (~630:1) are not that bad, the image appears to be slightly pale. Dark movies and gaming scenes carry a significant gray tint. Outdoor enthusiasts should avoid the MBYG2GE at all costs. Because of the low brightness and the highly reflective surface, one can forget using the device outdoors. Our photos, which were taken on an average bright day, speak for themselves. In the right image, the desktop is only barely visible. There is also criticism regarding the viewing angle. 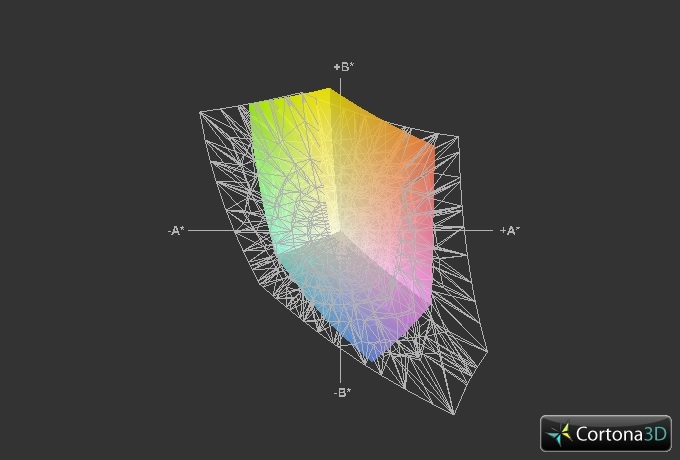 In particular, there are distortions when changing the vertical angle. However, horizontally, there are also some distortions. Consequences: The all-rounder is suitable for one viewer at most. However, one should mention that most competitors also carry similar poor viewing angles. 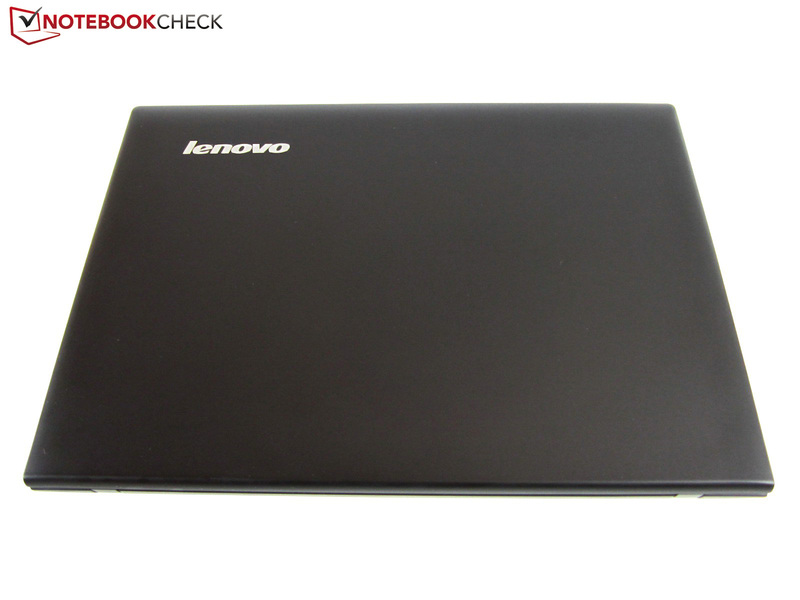 Lenovo has made a very intelligent choice concerning the processor. While a majority of the mobile Intel quad-core CPUs are specified at 45 Watt TDP, the Core i7-3632QM - like most dual-core processors - has a TDP of 35 Watt. In everyday life, this not only means less heat emissions, but also lower power usage. Generally, the Core i7-3632QM does not have to hide behind its 45-Watt siblings. Six MB L3-Cache are as impressive as 1.4 billion transistors. 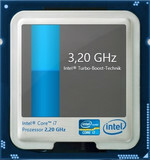 In comparison to the popular Core i7-3630QM, which is also based on the Ivy Bridge architecture and the smaller 22 nm structure, the Core i7-3632QM is clocked lower (2.2-3.2 vs. 2.4-3.4 GHz). The feature list is largely identical. 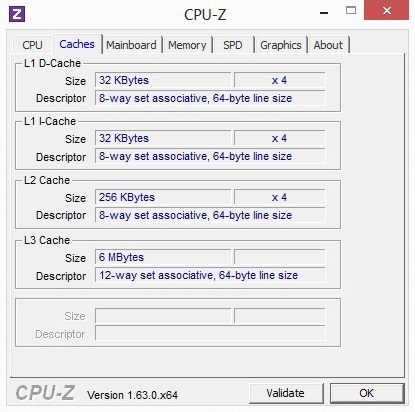 Owing to the Hyperthreading technology, the CPU can manage eight threads in parallel. 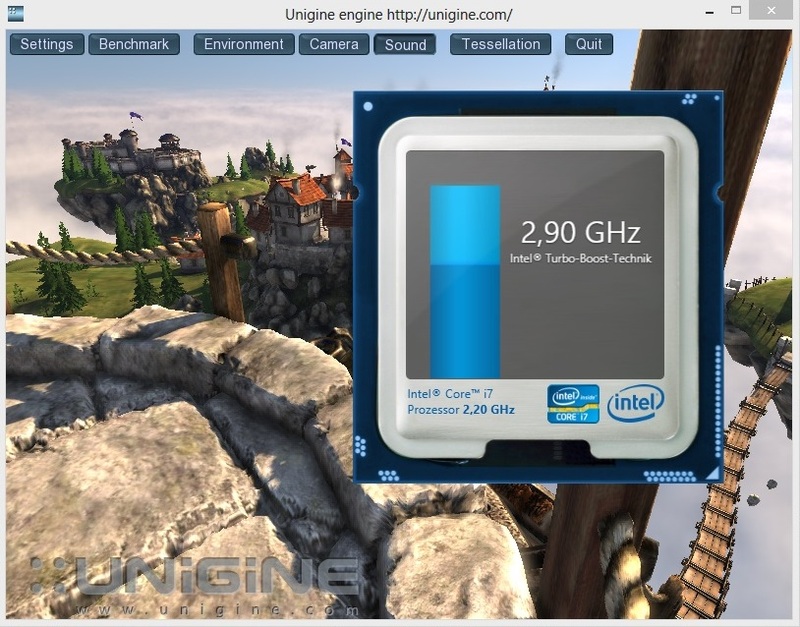 However, one should not expect too much from the integrated GPU HD Graphics 4000. Regardless of the graphics card: The Core i7-3632QM offers an ideal compromise between performance and energy consumption. 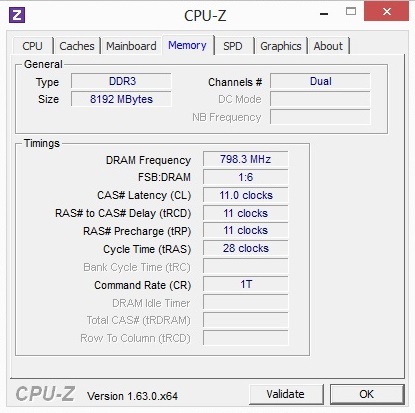 Let's have a quick look at the automatic overclocking function: Depending on the computing requirements, the Core i7-3632QM clocks between 2.9-3.2 GHz. Also, under simultaneous GPU load, the processor adjusts itself to approximately 2.9 GHz. We could observe a deactivation of the turbo mode only during stress test (FurMark + Prime). The CPU performance is representative of 45 Watt models. 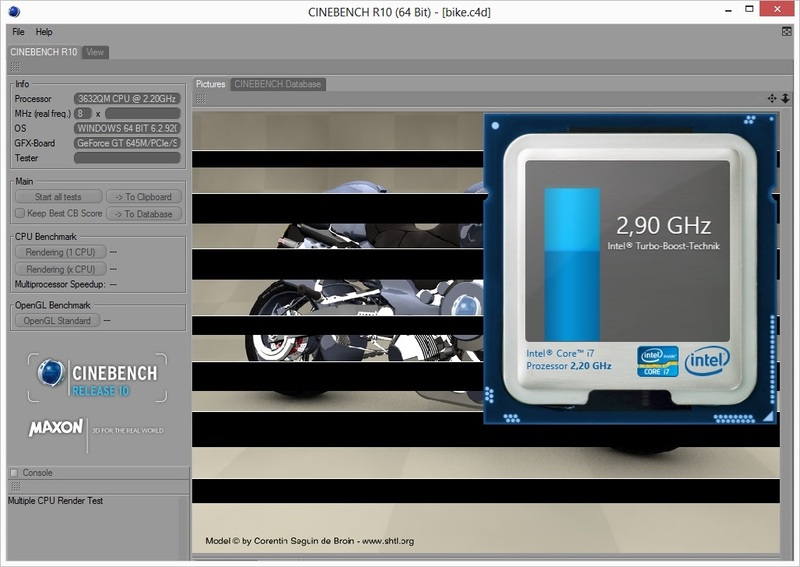 In the Multi Core Rendering scenario of the Cinebench R10 benchmark, the Core i7-3630QM achieves higher scores than the 3632QM, but with 22,101 (HP Envy dv7-7202eg) to 19,174 points, the gap is rather small. The dual-core siblings don't even stand a chance. 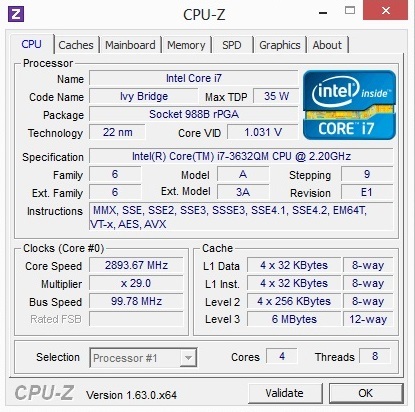 The Core i5-3230M, clocked at 2.6 - 3.2 Ghz, has to settle with only 11,108 points, i.e. roughly half the score (Acer Aspire V3-571G). Although Nvidia has already launched the 700M series, the GeForce GT 645M is still not a legacy product. The GK107-Chip produced in the 28-nm process is part of the current Kepler generation. 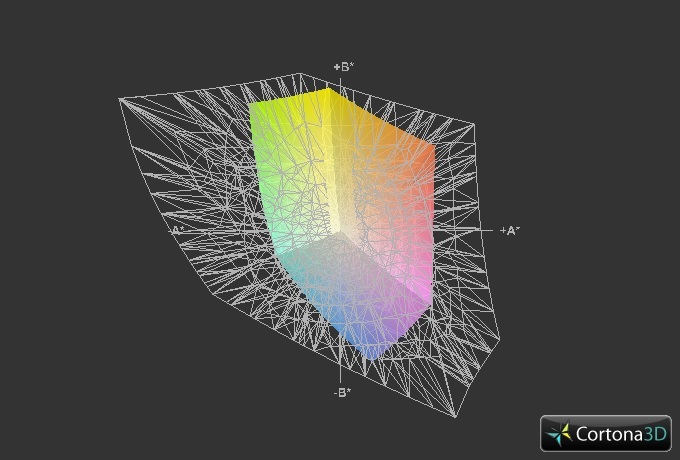 As with the smaller model, the GT 640M contains 384 Unified Shaders and 2,048 MB DDR3 graphics memory (900 MHz), which is connected with only 128 bits. 1.3 billion Transistors come close to the numbers of the Core i7-3632QM. 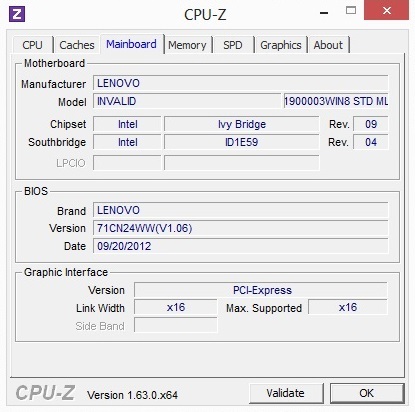 Pity: The overclocking function “GPU Boost” remains unused with the IdeaPad Z500. 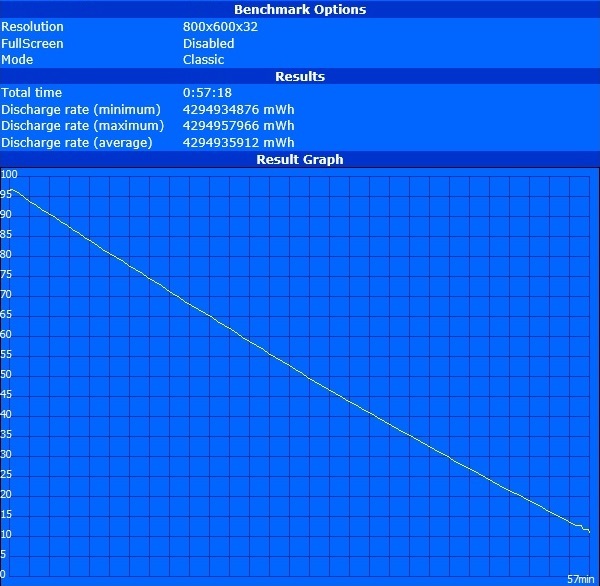 The tool GPU-Z also indicated the default 709 MHz under load. Theoretically, it would be possible to go up to 780Mhz. Depending on the benchmark, other GT-645M colleagues are better off (e.g. the Nexoc M507II). colleagues. 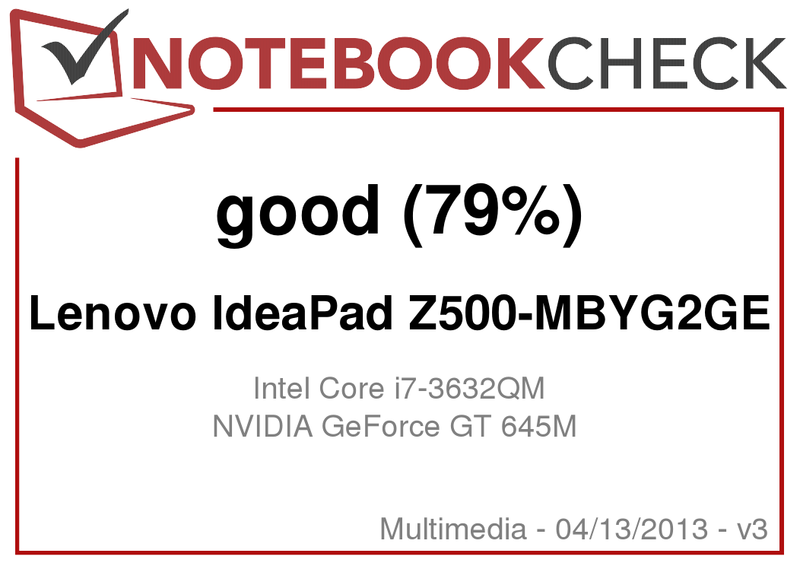 Within the Multimedia area, it has now become common that notebooks can switch between the integrated and dedicated graphics card without any delay - this is not any different for the IdeaPad Z500. Nvidia’s Optimus technology has established itself on the market and seldom causes grief. The Nvidia control panel scores with numerous comfort functions, optical assistance and settings (profiles, global setting etc.). Annoying: Our review unit came with an extremely old GPU driver, i.e. the ForceWare 305.46. Lenovo does not seem to be aiming at maximum performance. 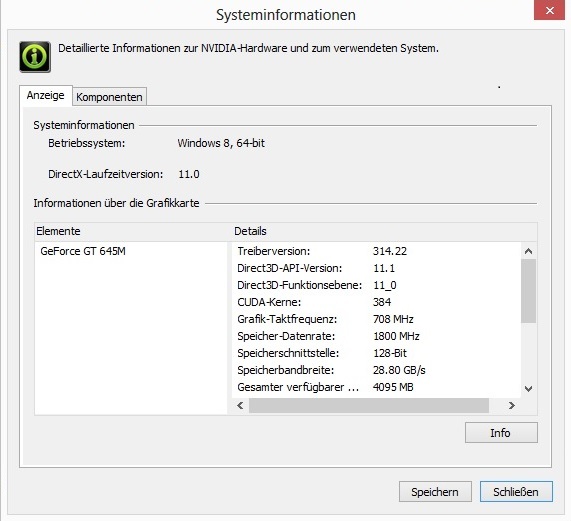 In order to unlock the full potential of the GeForce GT 645M, we manually installed the brand new ForceWare 314.22. The installation of an official Nvidia driver is not a problem. 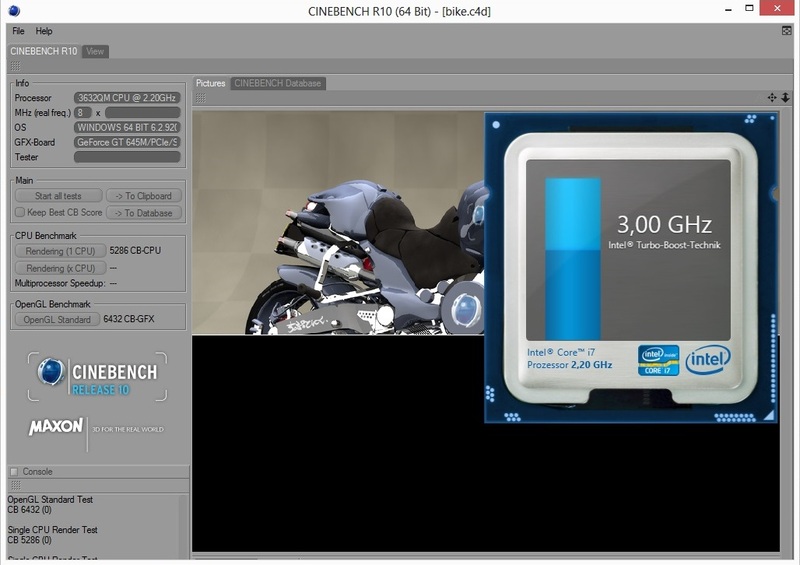 The GeForce GT 645M delivers a good performance in the synthetic DirectX 11 benchmarks. 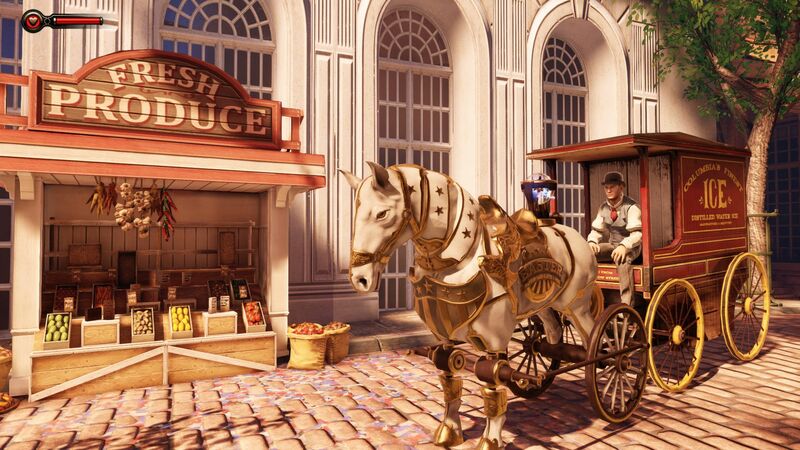 For example, let's look at the 2.1-Version of the Unigine Heaven: At 1280x1024 pixels, high details and the normal tessellation settings, the IdeaPad Z500 achieves semi-fluid 21.9 fps. This puts the Nvidia GPU together with the GeForce GT 740M (23.4 fps @ Asus N56VB-S4050H) and the main competitor from AMD, the Radeon HD 8750M (22.6 fps @ Samsung 510R5E-S01DE). We observe a similar situation in the 3DMark 11 (1280x720, performance preset): Both the GT 740M (2,066 points @ Asus A56CB-XX053H) and the HD8750M (1,796 points @ Samsung 530U4E-S02DE) surpass the GPU score of 1,743 points. 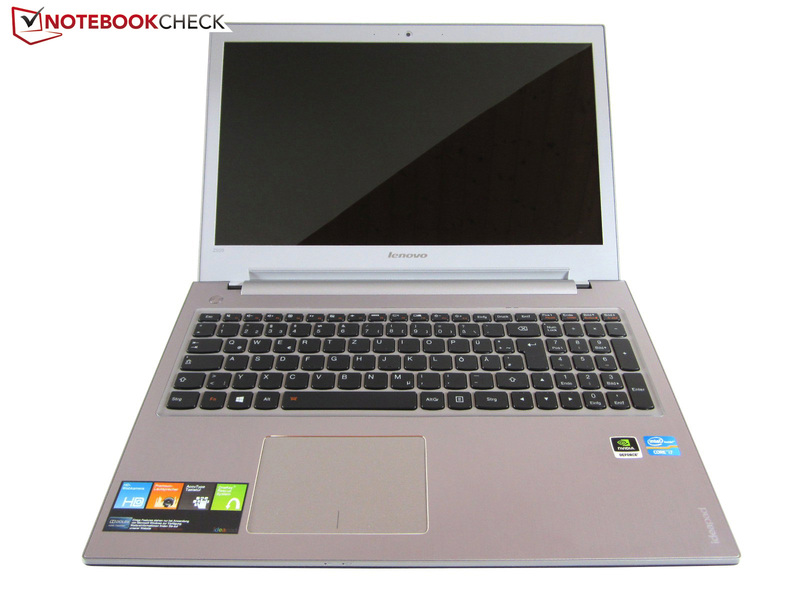 Note: The online shop Amazon offers the IdeaPad Z500 in a version with the GeForce GT 740M. As mentioned initially, there is a large 1,000 GB HDD, which runs at 5400 rpm. Despite the fact that it is not a 7200 device, the hard drive delivers above average values. 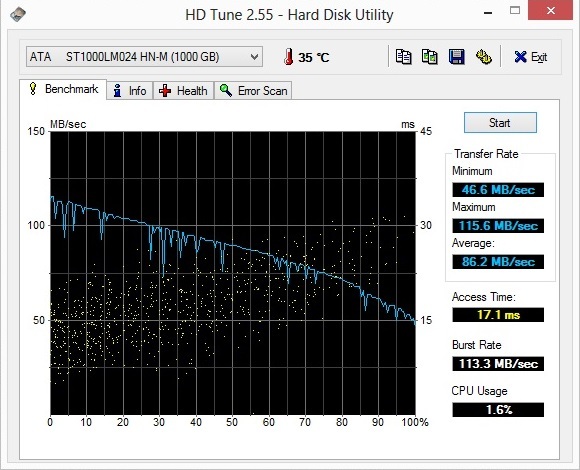 Beginning with the tool HD Tune: An access time of nearly 17 ms and an average transfer rate of approximately 86 MB/sec should not be taken for granted in the HDD area. 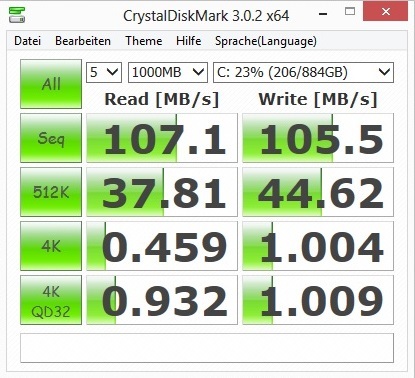 In the CrystalDiskMark, the IdeaPad Z500 even exceeded the 100-MB mark (sequential test). Just so there is no misunderstanding: The HDD obviously cannot compete against Solid State Drives. During multitasking, the outdated technology quickly reaches its limits. 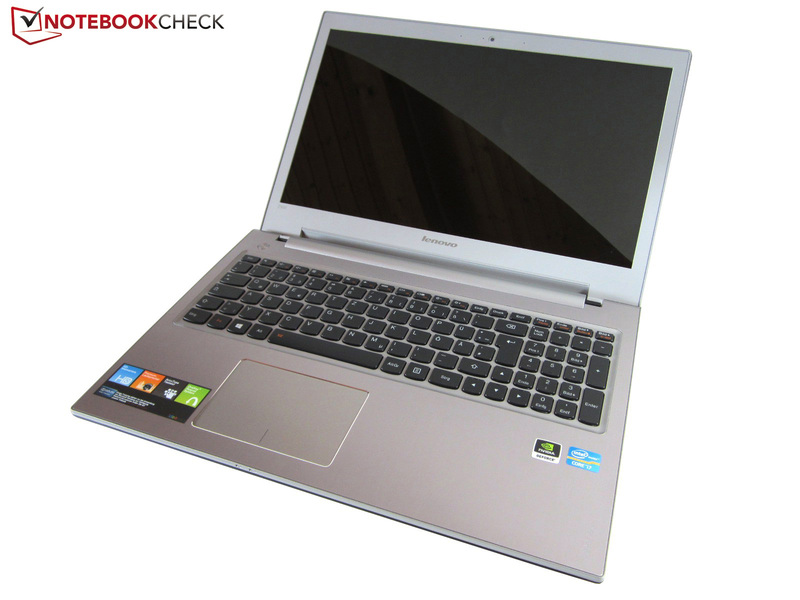 With a PCMark Vantage Score of 8,553 points, the 15-inch device is on the level of other middle class notebooks such as the Toshiba Satellite P855-107 (Core i7-3610QM & GeForce GT 640M), the HP Pavilion dv7-6c07eg (Core i7-2670QM & Radeon HD 7690M XT) or the Samsung Series 3 350V5C-S07DE (Core i7-3610QM & Radeon HD 7670M). 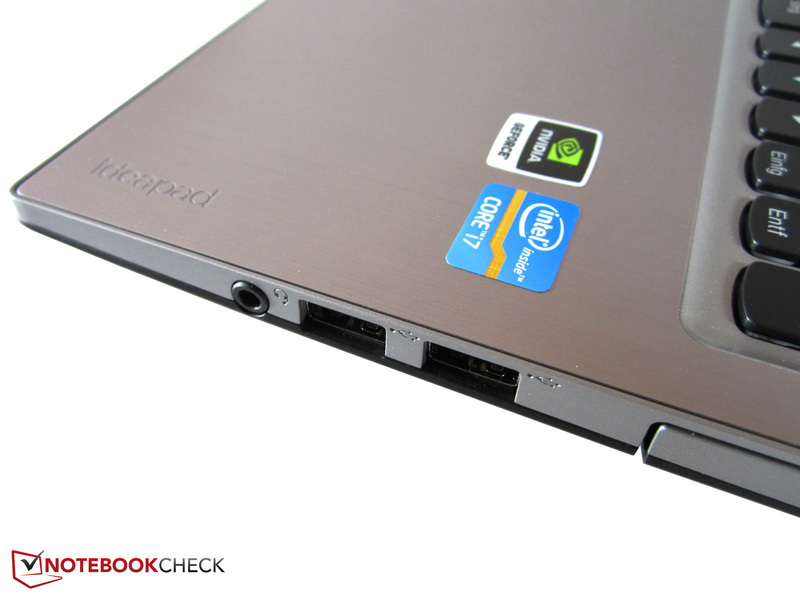 Gaming enthusiasts will have fun with the IdeaPad Z500. 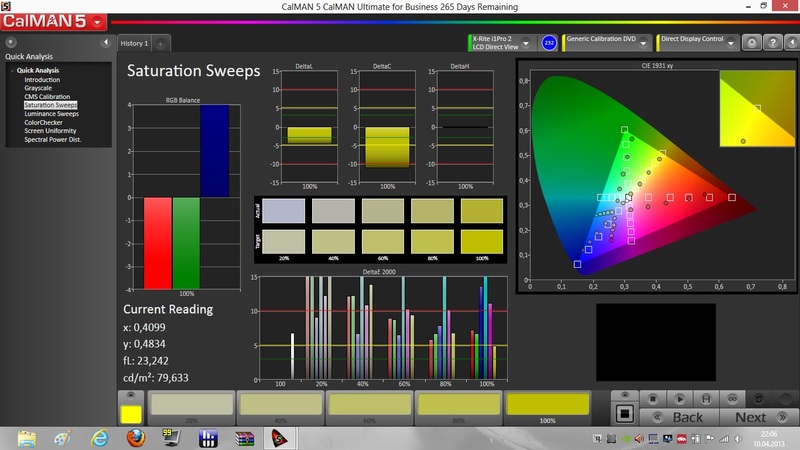 At the native resolution of 1366x768 most games run smoothly even with high details and activated anti aliasing. 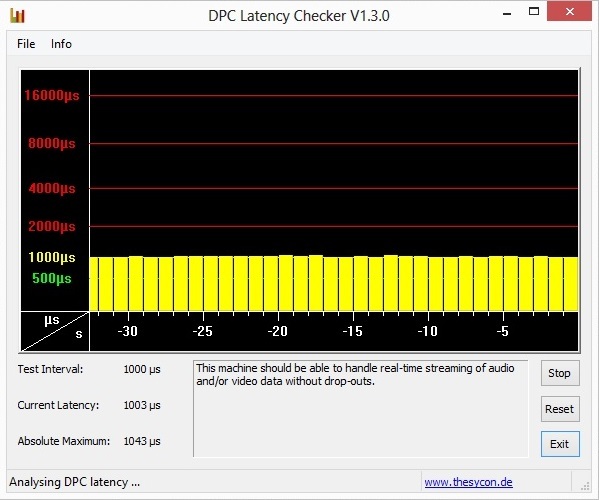 Only when playing extremely processing intensive titles such as Hitman: Absolution, Crysis 3 or Far Cry 3, one must reduce the quality levels to medium. As hardware requirements will rise on the back of upcoming console generations, one shouldn't expect too much future-proofing. At the moment, the performance is still sufficient for current games. As shown in the table below the article, the GeForce GT 645M is slightly defeated by the GeForce GT 740M. The gap is usually less than 10%. 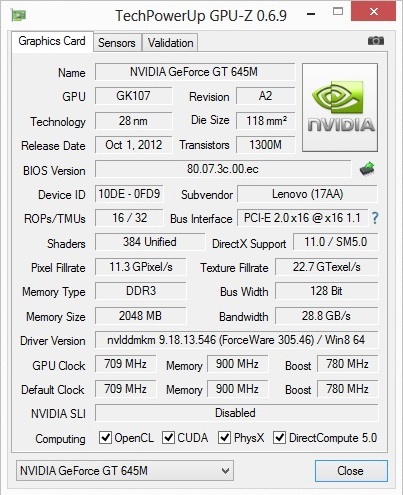 The GeForce GT 650M can often differentiate itself clearly. Noise emissions are acceptable. 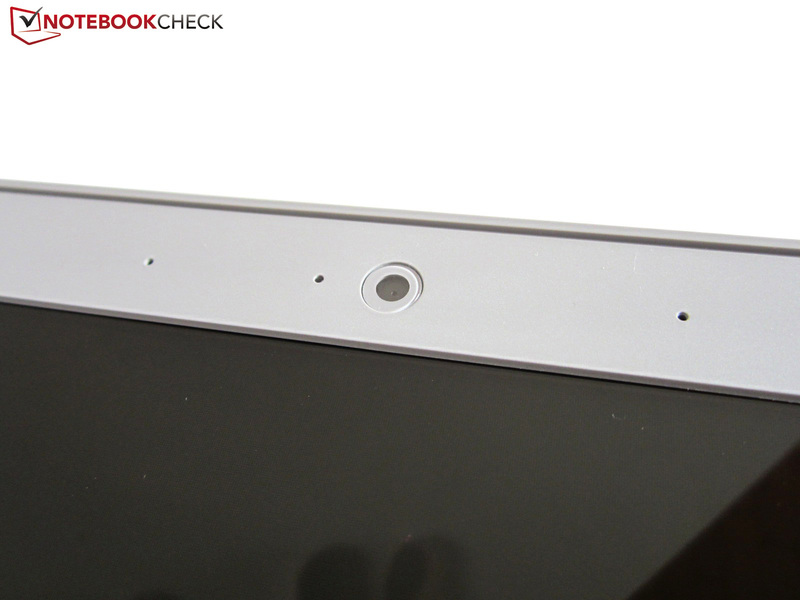 If the system is not too busy, the 15-inch unit is barely noticeable. Depending on the situation, either the fan (~33-34 dB(A)) or the HDD (~31 dB(A)) becomes apparent. 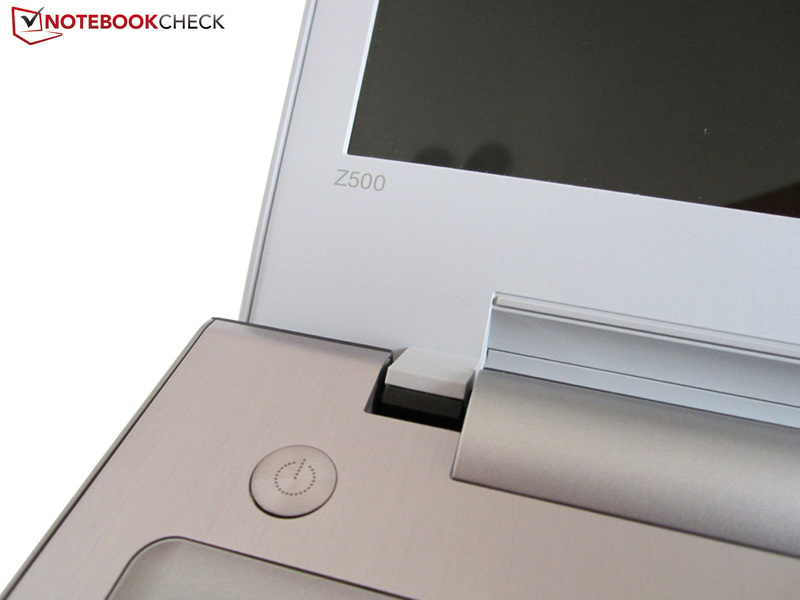 Some users might find the HDD behavior annoying: During accessing, the 5400 device is inclined to make clicking noises. Speaking of accessing: The DVD burner becomes rather loud during our review. Even during playback of a movie, we could measure nearly 42 dB(A). This value is relatively high (optical drives usually operate below 40 dB(A)) and would be getting on one's nerve over time. Unfortunately, we are unable to tell whether we were just unlucky with our review unit or whether it is a common problem with this series. The fan also has to take some criticism. 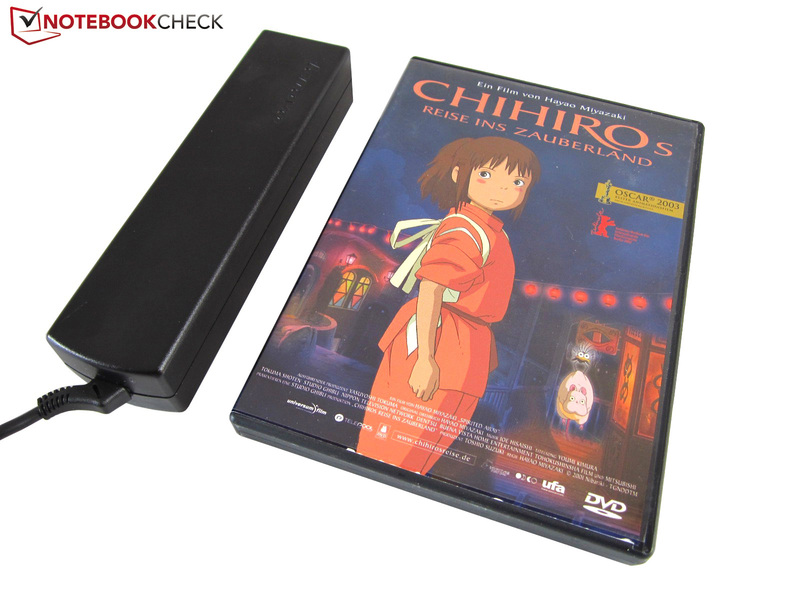 During everyday usage, the notebook is already quite noticeable (e.g. browsing). 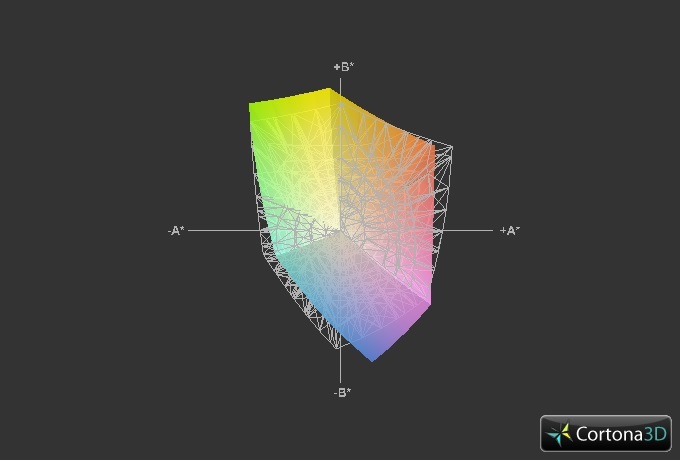 Approximately 37 dB(A) during 3DMark 06 is typical for a multimedia device. 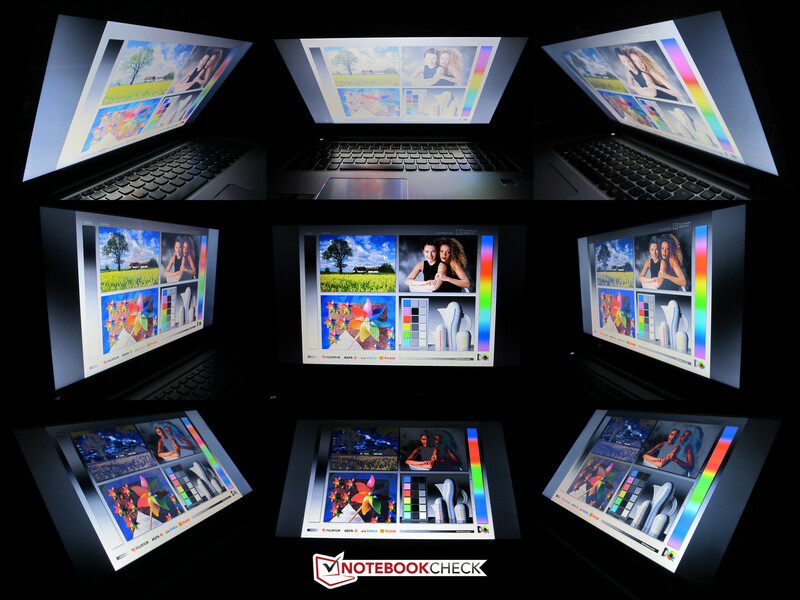 The high temperature emission is one of the largest weaknesses of the all-round notebook. With an average temperature of 30 °C (86 °F), the case already reaches a relatively high level during idle operation. After one hour of stress test, the base unit reached over 40 °C (104 °F). During spot testing, our measurements showed even 49 °C (120.2 °F top side) to and 60 °C (140 °F bottom). Playing a PC game on your lap would not be very wise. Some users will feel that the surfaces become unpleasant during long gaming sessions. The components are not faring any better. 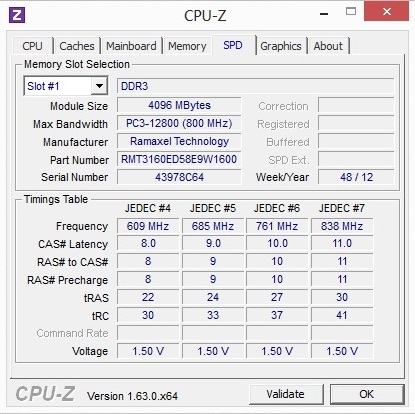 Although the Core i7-3632QM operates at the basic clock rate under full load, the CPU reaches 90 °C (194 °F) according to the tool Hardware Monitor. 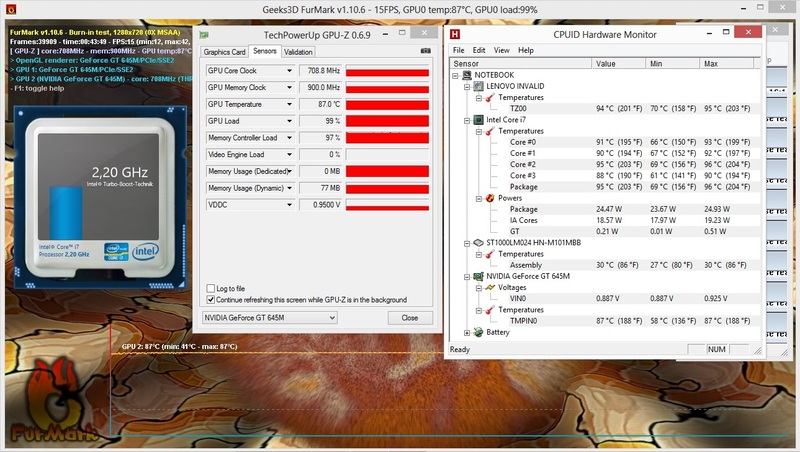 A GPU temperature of 87 °C (188.6 °F) maximum is also relatively high. Under normal conditions (incl. games), the components do not become that warm. A combination of FurMark and Prime is considered an extreme and unrealistic scenario. (-) The average temperature for the upper side under maximal load is 40.2 °C / 104 F, compared to the average of 30.9 °C / 88 F for the devices in the class Multimedia. (-) The palmrests and touchpad can get very hot to the touch with a maximum of 44.8 °C / 112.6 F.
(-) The average temperature of the palmrest area of similar devices was 29.1 °C / 84.4 F (-15.7 °C / -28.2 F). 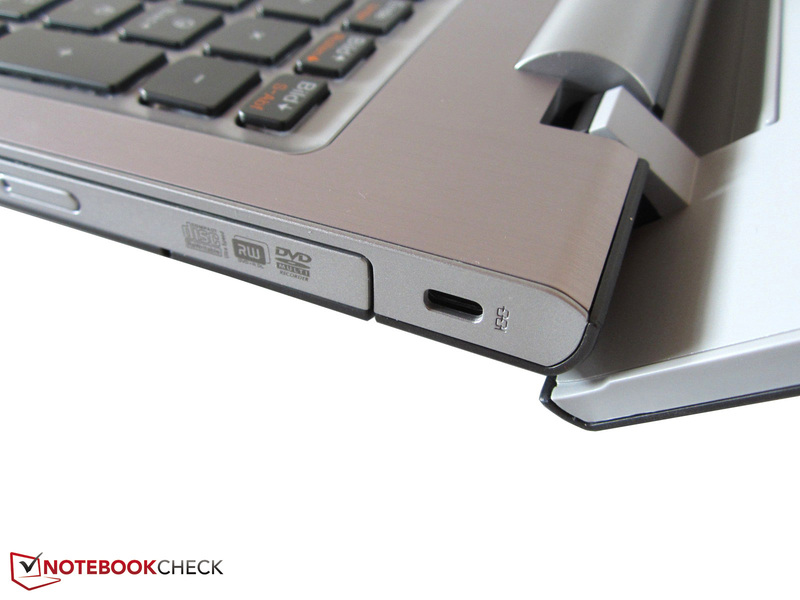 The IdeaPad Z500 offers a reasonable sound quality. Lenovo has integrated two speakers at the bottom front, which do not deliver stellar performance, but are able to produce usable results via Dolby Home theater v4. The technology gives the sound more volume, richness and dynamics. Great: The Dolby software allows for preset profiles as well as individual profiles (plus equalizer). Nonetheless, there is still some room for improvement. As with most notebooks, the sound is tiny, dull and soft. The good maximum volume can only make up for this flaw to a small extent. In the long term, we would recommend using headphones or external speakers. 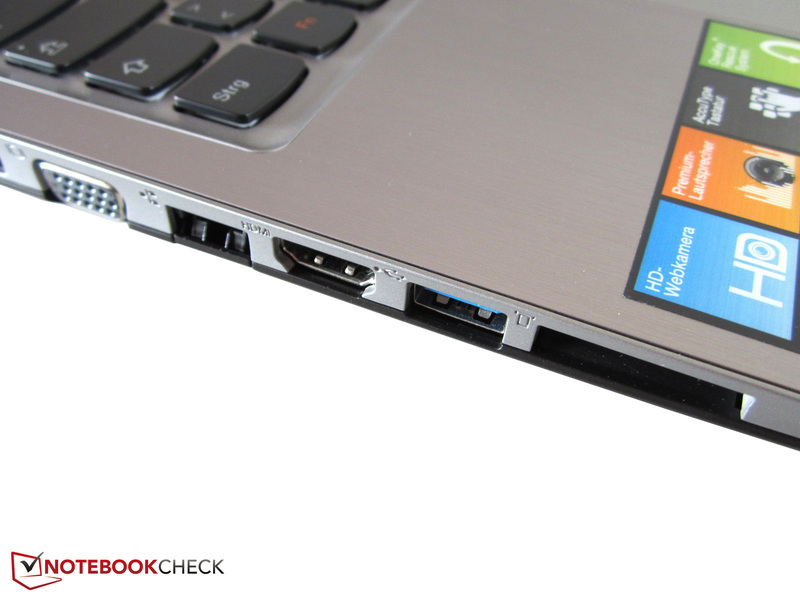 The Asus N56VB definitely produces better sounds for games, music and movies. For occasional use, the 2.0-System is usable however. Compared to competitors, the Z500 is above average. With regards to energy consumption, we would think of the adjective "unspectacular”. At 8-21 Watts during idle load, the 15-inch unit consumes as much energy as the GT-645M competitor Nexoc M507II (10-17 Watts). Under load the IdeaPad Z500 proves to be somewhat more economical. 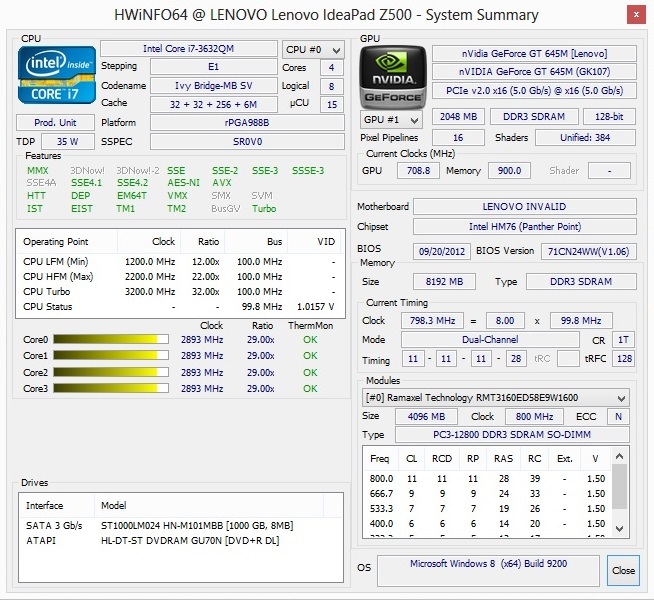 While the Nexoc M507II reaches 68 Watts during 3DMark 06, it is only approximately 59 Watts for the Lenovo device. Principal reason: The more economic CPU (35 vs. 45 Watts of TDP). As the manufacturer has only integrated a 4-cell battery with 4500 mAh, the battery life does not reach peak values. About five hours in the Reader's Test of Battery Eater (minimum brightness, low load) and one hour in the Classic Test of Battery Eater (high load, maximum brightness) does not necessarily generate applause. Performance could also have been better when performing more practical tasks. 2.75 hours of DVD playback and 3.75 hours of web browsing are neither particularly much nor particularly little. At first sight, the IdeaPad Z500-MBYG2GE appears to be a successful multimedia notebook overall. 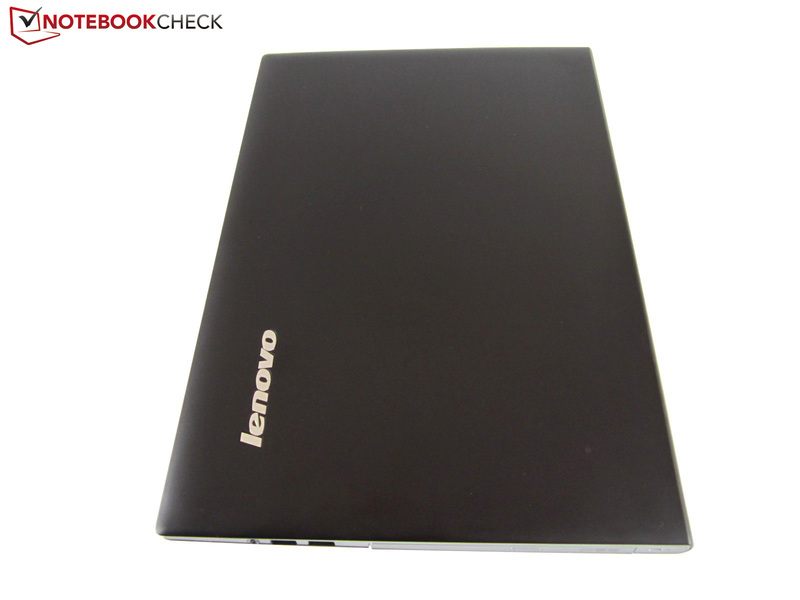 Beside the capable energy-saving hardware, there is also the slim case of three centimeters. The all-rounder combines a simple and nevertheless sophisticated design. 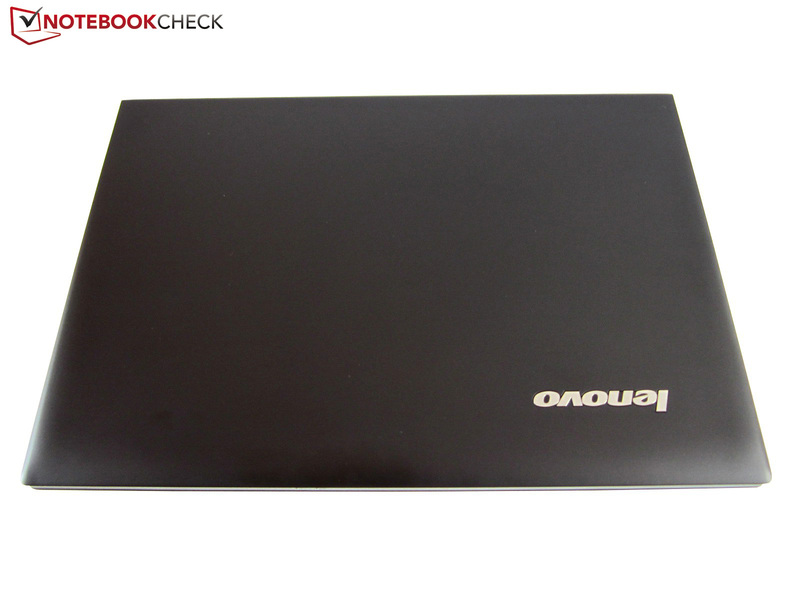 Lenovo also shows good thinking in terms of the power adapter and software. However, the overall impression suffers due to various flaws, which are quite annoying when adding them all up. 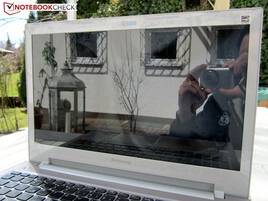 For example, there is the low-resolution HD panel that annoys with poor viewing angles and a highly reflective surface. Users who use the device primarily for work and web browsing, should look for a matte version. 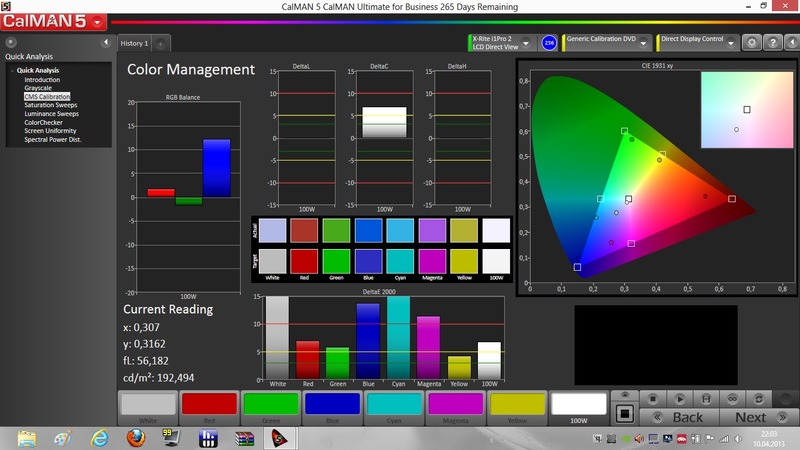 The weaker colors are compensated by lower sensitivity to reflections. Furthermore, we had to criticize the connectivity options (no Gigabit LAN! ), the keyboard (spongy typing) and the heat emission. The loud DVD burner, non-existing upgrade options and the non-removable battery also push the rating downwards. 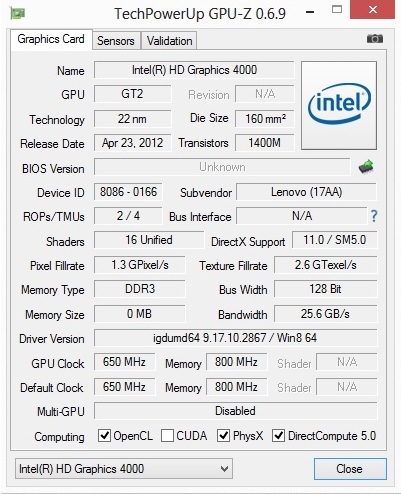 It is also hard to understand why Lenovo installed an extremely old GPU driver. 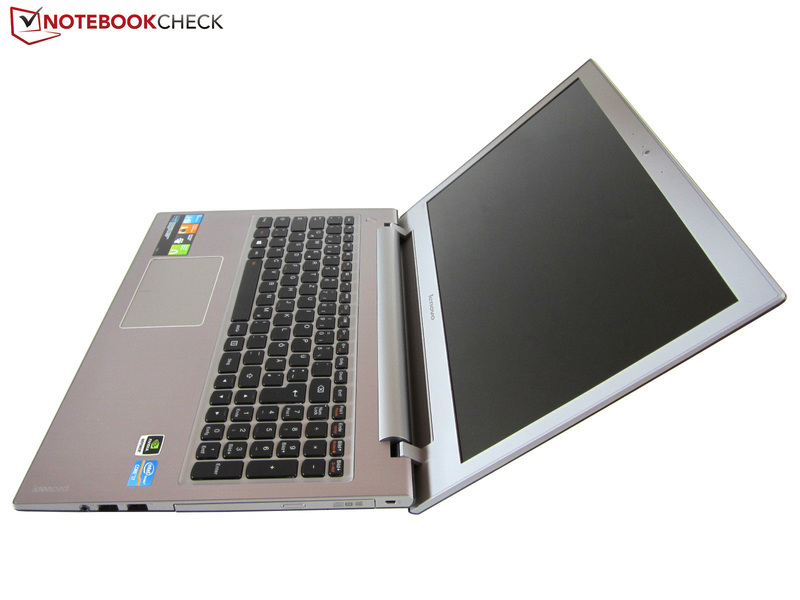 Despite the good starting point, the multimedia notebook was not able to impress us in the end. Within the price range around 800 Euros (~$1044), one can find better alternatives. 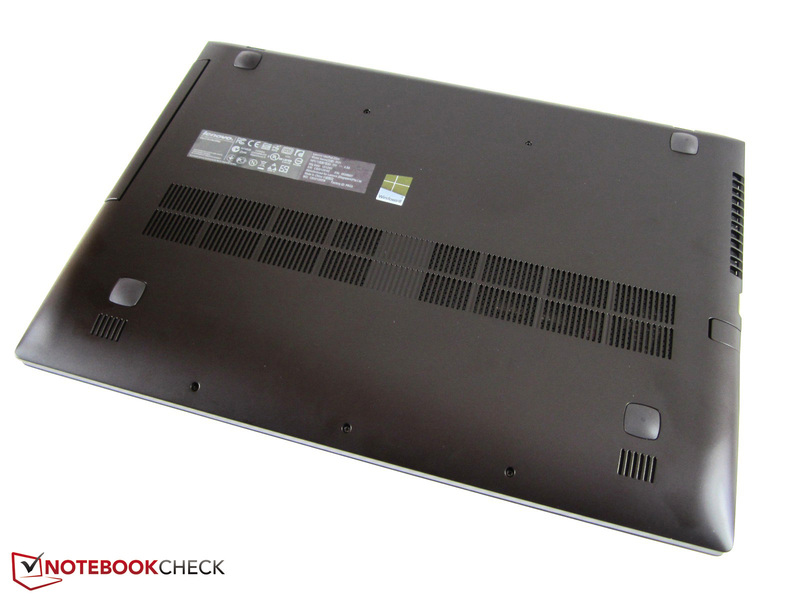 AMD fans should take a look at the Samsung Series 5 510R5E, which is lighter and slimmer, hence offering better mobility. If you place great importance on good image quality, the Acer Aspire V3-571G (high-contrast IPS panel) or the Asus N56VB (high brightness TN-panel) might be what you are looking for. The 35 Watt CPU is one of the greatest highlights. 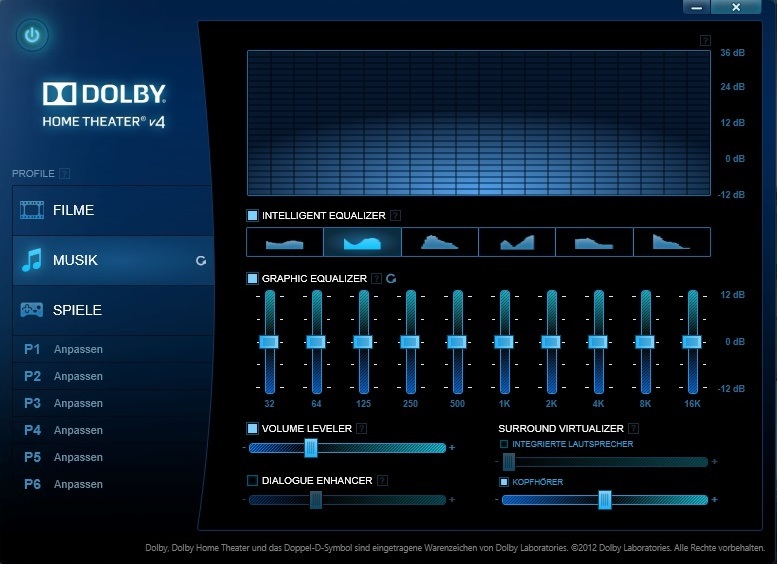 The multimedia enthusiasts get a certification for Dolby Home Theater v4. The touchpad mechanics are not everyone's cup of tea. One audio jack is a bit little. The dvd burner is surprisingly loud. Only one USB port is USB 3 compatible. Have you ever seen a similar power supply? 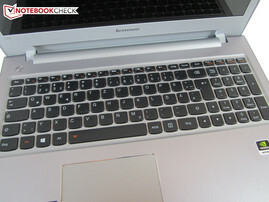 The reviewed model can be bought for 800 Euros. Lenovo has created a visually pleasing multimedia notebook. ...and a silver keyboard area. The bottom plate doesn't have a maintenance cover. The Z500 is relatively slim for a 15 inch unit. Nearly 2.4 kg is also fairly little. Thanks to the matte case, there aren't many smudges. The allrounder can be opened up to 135°. The material quality is above average. The glare display reflects quite a bit. From the outside, one won't be able to guess its powerful components. The left side can get quite hot under load. The optical drive is located on the right hand side. Pity: The battery is not removable. Of course there is a webcam and microphone. The display frame is lighter than the lid. 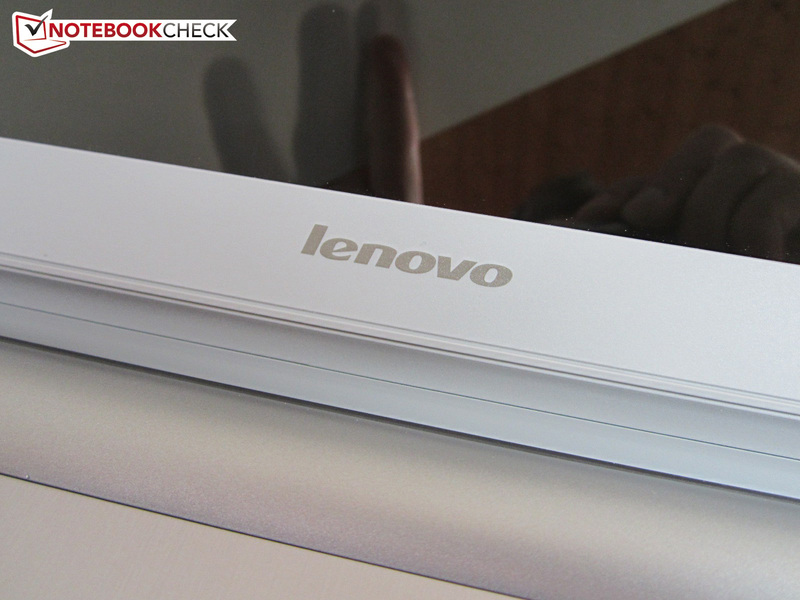 Lenovo combines metal with plastic. Die keyboard gives in on some places when pressure is exerted. Fn + space (de)activates the keyboard backlight. The manufacturer has included a number keypad. The case is visually pleasing. A stable keyboard, a removable battery and a good non-glare panel. Why does the manufacturer install an outdated GPU driver? 15-inch multimedia notebooks, which cost less than 1,000 Euros. 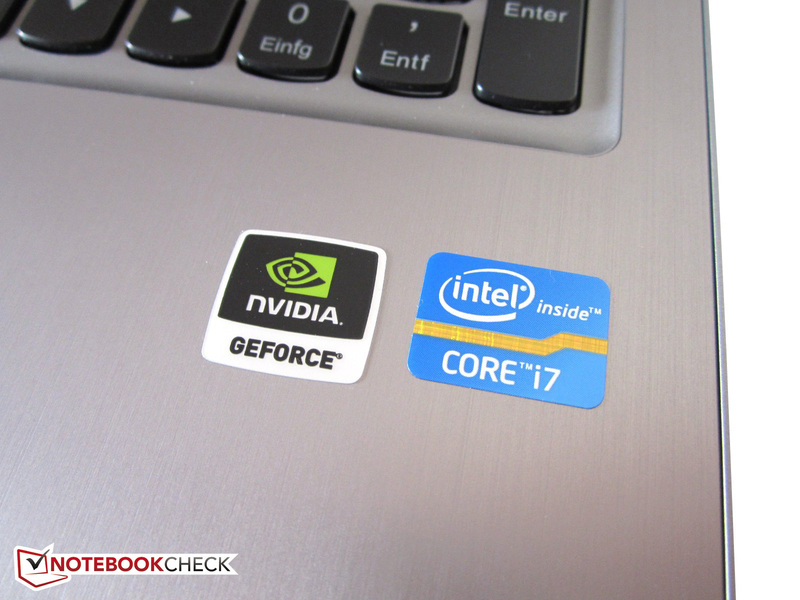 Either based on Nvidia graphics: Acer Aspire V3-571G, Asus N56VB, Fujitsu Lifebook AH532, Medion Akoya P6815 and MSI GE60. Or on AMD solutions: Dell Inspiron 15R-5521, HP Envy m6-1101sg and Toshiba Satellite L850-153.